One of the best things about musicals are the songs and dance routines so I was delighted to be in the audience for Ellesmere Musical Theatre Company’s annual celebration of songs from shows old and new, offering the audience and entertaining trip down memory lane. From the “Sister Act” Bless Our Show opening, whose lyrics provided the perfect star and which beautifully displayed the voices of the entire company to “The Producer’s” Goodbye which was the perfect fun encore, though all of the much deserved applause meant we struggled to hear the singing, the evening provided the audience with a fabulous night at the musicals, from magnificent solo performances and duets to wonderful harmonies from the entire company, with hilarious comedy and crisp choreography along the way. Joanna Thornewell – Performed Diva from “A Spoonful of Stiles and Drewe” (a musical I hadn’t previously come across) with brilliant diva tendencies and a purposely bad comedic operatic cabaret voice that only a great singer could perfect. Her performance could grace any cabaret stage. Adam Walker – After an outstanding leading role in Splinter’s Theatre Group’s “West Side Story” in September (read review here) Adam continued to prove he has an amazing leading man West End stage worthy voice and incredible stage presence that is only getting better and better displayed here in his performance of “Hunchback of Notre Dame’s” Out There. Alice Goldsbrough – Continuing to prove she possesses one of my favourite voices in the company and that her beautiful, clear voice is as perfectly suited to musicals as it is to Disney classics, confirmed by her performances of Tale As Old As Time from “Beauty and the Beast”, which if you closed your eyes listening to it you would be unable to spot the different between Alice and the original animated film version. Tara Marshall-Unitt – Showcased an excitingly powerful soul voice full of emotion that perfectly suited her performance of Home from “The Wiz” (another musical I hadn’t previously come across but now will go out of my way to do so). Keeley Kilby – From providing a the fabulous opening solo of Bless Our Show to her passionate duet of You & I from “Chess” with Simon Wright that left me with goosebumps and her fabulous solo number Don’t Rain On My Parade from “Funny Girl” Keeley provided the stand out performances of the night combining the incredible voice, range, attitude and stage presence to be a true star. Sara Hibberd – Alongside superb seamless dancing skills, natural stage presence and her stunningly beautiful voice providing the solo opening for I Wish I May from my favourite stage musical “Witches of Eastwick”, Sara’s performance of The Wizard & I could have been beamed live from a Broadway stage production of “Wicked” and should make any casting director immediately give her the part. And when the wondrous voices of Keeley and Sara combined in their incredible duet of In His Eyes from “Jekyll & Hyde” pure musical magic resulted as they perfectly and emotionally complimented each other. Gary St John – From his deep operatic voice full of comedy and personality in his performance of “Kiss Me Kate’s” Where Is The Life I led? (which makes me hope one day he will perform Baron Bomburst in Chitty Chitty Bang Bang) to his powerful opening solo of This Is The Moment from “Jekyll & Hyde” Gary proved he has an amazingly versatile yet powerful and moving voice and stage presence. Other musical numbers from the evening which deserve a mention include Tradition from “Fiddler on the Roof” whose lyrics were cleverly re-worded to reflect the company’s 70th anniversary, was wonderfully led by David Jefferson and displayed the company’s choral skills; Puttin’ On The Ritz by Irving Berlin, which provided crisp, in sync tap dancing in a number full of old school Hollywood glamour; and Someday from “Hunchback of Notre Dame”, which took me back to my 90s Eternal loving day (they sang the film version) but which Eleanor Taylor’s beautifully emotional opening improved upon. Isabel Andrews and Bethany McKay’s performance of one of my favourite ever song’s On My Own was wonderfully arranging and proved the song worked as powerfully as a duet as it does a solo number before the full company’s performance of the same musical’s song “One Day More” brought a tear to my eye and more than proved that the company had the voices and passion to pull off a spectacular full scale production of “Les Miserables”. From Act 2, special mention needs to go to real life newly weds Jane Jefferson-Blythe and David Jefferson who performed The Song That Goes Like This from “Spamalot” with great chemistry and comedy that proved they are perfect together, whilst “Not While I’m Around” performed by the full company gave a perfect introduction to the company’s next production “Sweeney Todd” (for further information click here). Full of amazing voices, fantastic musical arrangements, stunning harmonies and great choreography, all supported by a wonderful orchestra, Show Stoppers continues to prove that after seven decades the members of Ellesmere Musical Theatre Company can turn their hands (and voices) successfully to any musical, classic or contemporary. 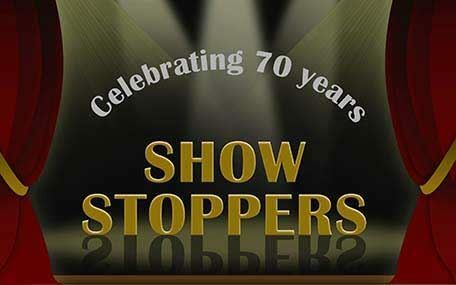 Celebrating its 70th anniversary this year, Ellesmere Musical Theatre Company perform an annual musical plus this, their performance of show stopper tunes from musicals, at the Montgomery Theatre, Sheffield. For further information on Ellesmere Musical Theatre Company visit www.ellesmeremtc.co.uk. Show Stoppers is on at Montgomery Theatre, Sheffield at 7.15pm until Saturday 14 October, with an additional matinee performance at 2.15pm on the Saturday. Tickets are £14 (£13 concession) and all tickets booked for the Saturday evening performance will have £1 of the ticket price donated to The Montgomery Seat Angels Appeal. To book visit http://themontgomery.org.uk/events/show-stoppers. I was so pleased to be watching the showstoppers at Montgomery last night. Everyone did amazingly. The main people who stood out for me, was the beautiful solo/girls someday from the wonderful hunchback of notre dam. The wizard and I and many more. Well done to everyone involved. Can’t wait for the Elsmere performance next year.